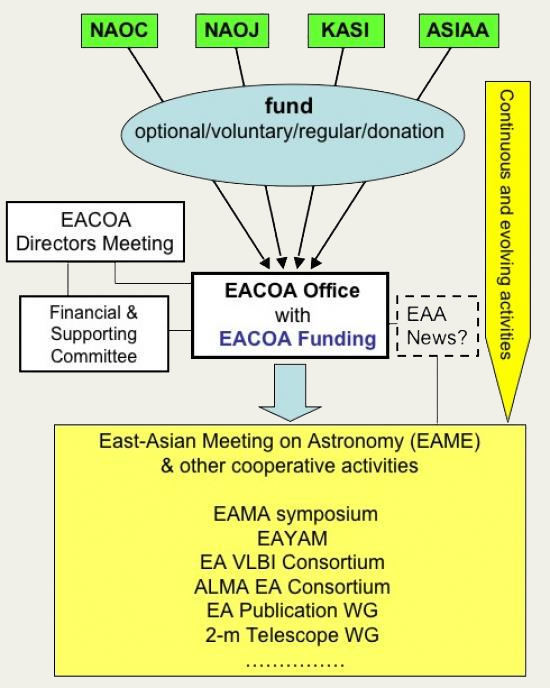 East Asian Core Observatories Association (EACOA) consisted of four core observatories in East Asian: National Astronomical Observatories of China (NAOC), National Astronomical Observatory of Japan (NAOJ), Korea Astronomy and Space Science institute (KASI), Academia Sinica Institue of Astronomy and Astrophysics (ASIAA) is formed to foster and coordinate collaborations between the major astronomical observatories in the region. Development of alliance program in research, instruments and telescope construction. Coordination of the exchange and use of observation instrumental and other resources within East Asia. ©2018, East Asian Core Observatories Association (EACOA), All Rights Reserved.